Dry ingredient processing and powder delivery for superior efficiency. 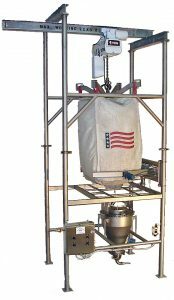 Semi-Bulk Systems multiple dry ingredient automation processes are designed to deliver powder from any package for shipment or from silo storage. A single process may include multiple bulk bag unload stations, paper bag dump stations and silo delivery to a filter/receiver station. A single modular Vacucam® Ejector Mixer system will convey and mix multiple ingredients on a sequential basis and deliver the finished slurry to a single batch tank or to any one of several batch tanks.